← Read an Ebook Week! We have author Heather McCorkle back in the house! Channeler’s Choice, the sequel to Heather’s The Secret of Spruce Knoll just released and this is a stop on her tour. I asked Heather’s main characters a tough question, but before we get to their answers, here’s a little about Heather and Channeler’s Choice. 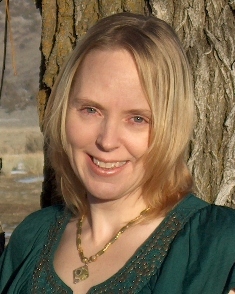 I am an author of young adult fantasy, in all its many sub-genres. Helping other writers and supporting fabulous authors is my passion. When I’m not writing or surfing my social networking sites, I can be found on the slopes, the hiking trails, or on horseback. As a native Oregonian, I enjoy the outdoors almost as much as the worlds I create on the pages. No need to travel to the Great Northwest though, you can find me on my blog four days a week, and Monday night’s on Twitter where I co-moderate the #WritersRoad chat with my good friend TS Tate. With her parents’ murderers dead, Eren can finally concentrate on fitting in at Spruce Knoll High, not to mention figuring out what it means to be a channeler. If only it were that easy. It turns out she isn’t normal even among channelers – she may be a legendary warrior meant to protect the earth in a last great battle. But Mayan prophecies are the least of her worries as she involuntarily starts to gather her own Society, another girl moves in on Aiden, her powers rage out of control, and worst of all, someone is stalking her. To top it all off, Eren discovers she doesn’t have to be a channeler after all – she has a choice. As an old threat closes in and she risks ending up like her parents, she is forced to decide. Be a normal teenager and leave the legendary warrior stuff to someone else, or embrace a dark destiny? I really enjoyed The Secret of Spruce Knoll and can’t wait to read this one. Now on to the hard question I asked of Heather’s four main characters: What is the most difficult choice you’ve ever had to make? Eren: So far, that would have to be whether or not to let myself get close to people again. And I’m really glad I made the right choice on that one. 🙂 I have a feeling there are even tougher choices on the way though. Such is my life. Aiden: Standing up to my adopted family and deciding to expose them for the monsters they are was the hardest choice I’ve ever made. Even though they were horrible to me, they were all I had, or so I thought. I’m glad my choice taught me that there is better out there and I deserve to have it. Fane: Choosing to trust Aiden, a complete stranger who was raised under the dark influence of my maniacal cousins, was the hardest thing I’ve ever had to do. But something deep in my core told me he was a good person and that he would do what was right. Caitlin: The four inch heals or the wedges. LOL! No seriously, choosing to defy my parents and become friends with Eren and her Society wasn’t easy. I mean, they’re my parents. But in the end, my parents are wrong. Thanks for having the gang over Kristie! This was fun.